What happens when you catch a UK Record Fish ? Floating braid or sinking braid? 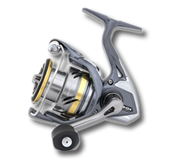 can a penn affinity 8000 be used with a Daiwa supercast? Have I made a mistake buying 2 penn affinity 8000 reels?